So you've setup your new Responsive Design template! Now you can easily add the new features. Note that the slideshow and background images only apply to specific templates - but you can easily swap amongst the templates if you want to try out other features/looks (just follow the simple steps in our previous article here). All of the updates below require you to login to your website Administration System - we won't mention this again in each step below! 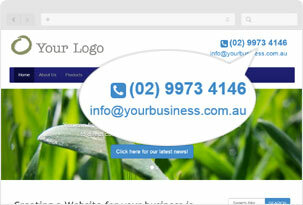 Add your phone number to the header of your website. 1 Click on "Content Manager" and then "Add Ons/Widgets". Scroll down this page past all of the "Social Media" add ons until you get to "Website Header Extras", the first one is "Telephone Number". 2 Click on the check box "Add to your web site Phone Icon with Link"
3 In the first field enter your phone number as you want it to appear on your website. You may want to add + or () to the number - or you may want to enter text such as "Click here to Call Us". 4 In the second field enter your phone number as it should be dialled. It is best to not include any extra text or characters (i.e. + or -) nor any spaces. If you get many international and/or interstate enquiries you may want to include the country code and area code - this will still work for local callers too. 5 Finished - just scroll to the bottom of the page and click on "Update Extras". Refresh your website to see the update. Add an email link to the header of your website. 1 Click on "Content Manager" and then "Add Ons/Widgets". Scroll down this page past all of the "Social Media" add ons until you get to "Website Header Extras", the second one is "Email Link". 2 Click on the check box "Add to your web site Email Address with Link"
3 In the first field enter your email address as you want it to appear on your website. You may want this to be your email address, or you may want to enter text such as "Click here to Email Us!". 4 In the second field enter the email address you want the link to send to. 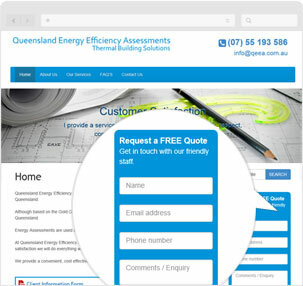 Add a "mini" enquiry form on the right side of every page. 1 Click on "Content Manager" and then "Add Ons/Widgets". Scroll down this page past all of the "Social Media" add ons until you get to "Website Header Extras", the third one is "Sidebar Enquiry Form". 2 In the first field select "basic" or "full" form. The basic form will only display fields for name, phone number, email address and comments/enquiry. If you select "full form" it will display all of the fields you choose by going to "Content Manager/Form Manager". 3 In the second field you can enter a tagline to show up above the form. You can leave this blank if you don't want a heading. 4 In the third field you can enter a subheading to show up in smaller type above the form. You can leave this blank if you don't want a subheading. Setup your Slideshow - Photos, taglines and links. Some of the new templates have a built in slideshow on the homepage. This slideshow can include different text/taglines one each photo as well as links from each photo. The photos for your slideshow will work best if they are cropped to the approximate dimensions - i.e. wide and short. The exact dimensions will vary as the slideshow scales to fit the width of the screen it is being displayed on - but a good guide is to have your photos 1000 pixels wide by 300 tall. 1 Click on "Content Manager" and then "Slideshow Editor". There will be either some default photos or your own previous slideshow photos. 2 Click on "Update" to change a photo - or click "Add A Photo". Click on "Choose File" and navigate your hard drive to find your photo and select it. Click on "Upload Photo". You can now downsize your photo if needed. Click on "Save Image to Server". You can continue to add photos this way. 3 Once you have uploaded your photos, you can add text and/or links to them. Click again on "Content Manager" and then "Slideshow Editor". For the photo you want to add to, click on "Update". Scroll to the bottom of this page. The "Headline" field appears first on the photo in a larger font. The "Text" field will appear in a smaller font below the headline. You can add "Link Text" (i.e. "Click here for more info") which will appear in a button beneath the headline and the text. Then add the "Link URL" you want to link to - this will typically be another page on your website - you can copy and paste this from your website or enter "pagename=XXXXXX" where XXXXXX is the name of the page you want to link to (this must be exactly as you have named the page). Click on "Update Slide Text" to save your changes. 4 You can repeat step 3 for each of the photos in your slideshow. You can leave any of the fields blank if you don't want them to appear. Once finished refresh your website in the browser to view the changes. 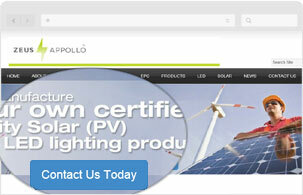 Some of the new templates use full screen background images behind the website layout. You can opt to have your background images display as a slideshow in the background on every page, or you can have a random photo show on each page or can have the images displayed individually on each page in the order you upload them. The photos for your slideshow will work best if they are reasonably high resolution. The exact dimensions will vary as the images scale to fit the width of the screen they are being displayed on - but a good guide is to have your photos approximately 1000 pixels wide by 800 tall. 1 Click on "Content Manager" and then "Update Background". There will be either some default photos or your own previous background photos. 3 Once you have uploaded your photos, you can choose how you want the background images to display. Click again on "Content Manager" and then "Update Background". Scroll down this page - you can change either of the settings or keep the default setting. Click on "Update" to save your changes. 4 Once finished refresh your website in the browser to view the changes. It is simple to repeat steps 3 and 4 to experiment with each setting to see which best suits your website.